More importantly, this challenge is about becoming a better person and living a better lifestyle. It’s about incorporating CLEAN food, regular and HARD workouts, stretching and yoga, SLEEP, and the company and support of great people all into your already crammed little world. It’s about pushing the boundaries on your good things, and leaving little to no room for the negative and harmful habits and attitudes we all fall prey to. It’s about getting the INSIDE RIGHT, so that the outside can follow. Yes, it’s a challenge and it’s meant to be so. The Challenge: To follow a strict Paleo diet and lifestyle regimen for 30 days. The Goal: To improve your LIFE LONG health, energy levels, mood, and workout performance. The Outcome: Healthier, happier, sexier. Seriously? HAPPIER? HEALTHIER? SEXIER? What 40-year-old woman doesn’t want that? Or a 20-year-old man? Or a 65-year-old whomever? WE ALL WANT THAT! 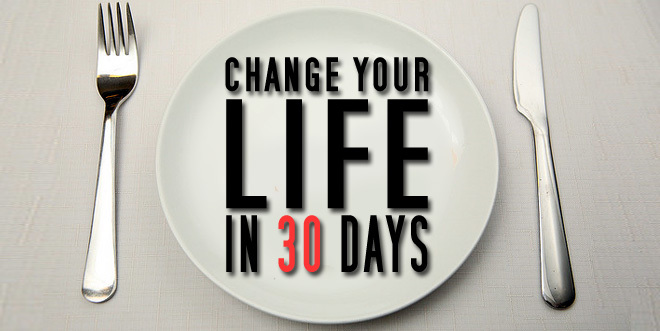 I wholeheartedly believe that you can change your life in 30 days. You CAN make the necessary adjustments that will positively alter your schema in that relatively short span of time. In fact, I am a walking billboard. Last December I admittedly was prepared to end my time here in Raleigh. I was over my job, my breakup, the city, dating, my perceivable options, and my apparent future. I was struggling with the cards that had been dealt to me and I was ready to take that deck and shuffle it out the goddamn window. So, when I was extended an offer that would have taken me far away from here, I viewed that as an opportunity to start over. To start anew. To begin again. I did not want to admit that it was my attempt to run away and eradicate. It was my futile attempt to actively control the situation. Then two things happened. Two things kept me still. The Power of Now by Eckhart Tolle. If you haven’t read it, or listened to it…do. Allow him to frustrate you and completely set you off. Then just open your tiny brain, and big heart, and endless soul and just listen. I promise you that it is life-changing. It might be one sentence, one phrase, or the entire freaking book. When ready; it will change everything. The good people of my Grinnell Executive Leadership group. When I told them about my impending move, I was unprepared for the completely adverse and violent reaction…and their subsequent challenge. Yes, as you may have suspected…they laid down a freaking 30-day challenge. In reality, they started with one week. They know me better than most, and they realize that Sarah needs a smaller bite of time to focus on…IF IT IS SOMETHING SHE WILL FIGHT. (I was going to fight.) If the ox is coming out, then don’t make it far-reaching. The ox needs a challenge she can breathe into. What was the challenge? To make NO life-changing decisions for one week. Do not pass go. Do not make a major decision. Let life happen. Relinquish control and let my pretty awesome life unfold itself around me. Without my control. Do it for a week; then do it for a month. I did. And where am I now? Happier than God ever made me. Happier than I should probably be. Engaged to the one that makes me spin gleefully. Ready to embark on a new adventure. Embracing the love of girlfriends and gay men. Forty and in the best condition of my life. And content. Content in all its gloriously aware and intentional ways. I live here in Raleigh. I live here with my friends and loved ones. I live here with gratitude…until I don’t. And then I will live there with the same sense of purpose, and intention, and gratitude. I will live each day like a 30-day challenge. CrossFit Invoke, Bootycamp, or click on over to Pain. Once you know Christmas and her amazing crew, you will not turn back. Paleo – Check out the Paleo side of my life. I thank Jason for it everyday. Grinnell Leadership – It’s hard to explain…but the JumpStart will…well, jumpstart. Eckhart Tolle – Listen, love, learn, change. Yes, he is so strange…but really, aren’t the coolest people always? Came across your blog and am loving it. I think it’s time for me to read Eckhart Tolle. Love you, boss! Glad we are doing the TNT runs this year! You are going to do amazing!! !